The Campanil editors are getting ready to boot down their computers, pack their bags and get out of the newsroom and to sunny Los Angeles. The Associated Collegiate Press (ACP) annual national conference will take place in Los Angeles from Feb. 26 to March 1. The conference is an opportunity for student journalists to network with other university newspapers and attend panels and workshops on writing, reporting, editing and more. This year several Campanil editors will be speaking on panels. Sports & Health Editor, Jen Mac Ramos will be speaking on the Covering Collegiate Sports panel. Editor-in-Chief Ari Nussbaum, Managing Editor Emily Mibach and Opinions Editor Dajanae Barrows will be leading a panel called How Queer: Covering the LGBTQ Culture in student newspapers. The California College Media Association (CCMA) awards will also be given during the ACP conference. 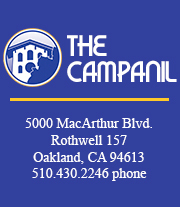 The Campanil has placed in four categories for the less-than-weekly division: Best Feature Story for Ramos’ “Mills student advocates for survivors of sexual violence;” Best Non-Breaking News Story for Fatima Sugapong’s “Oakland community responds to Ferguson verdict in protest;” Best Arts & Entertainment Story for Sara Melish’s “From Tehran to Mills: Dancer follows her dreams;” and Best Special Issue/Section for our Spring 2014 coverage of racism on campus. Official award places will be announced on Feb. 28. The Campanil will also be entering the ACP Best of Show contest, which names the best student newspapers of the nation. Keep your eye on our website to read editors’ blogs about ACP and check out our live-tweeting throughout the weekend. To see our coverage of previous ACP conferences, check out the ‘ACP’ section on our website. Click on our ‘About Us’ page for editors’ Twitter handles. The Campanil staff will return to their desks on March 1 with new skills and plans to improve the newspaper — and a few new awards to hang up on the newsroom’s walls.